F.M. Brown's provides a variety of treats and food for your companion bird. New Size! Extreme! Orange Slices Natural Treats are grown, sun-ripened and harvested in the USA with all the flavor and goodness nature intended. These treats are so naturally good, they can be offered daily and are 100% edible. Free of artificial colors, flavors and preservatives, these treats are a great way to reward your pet during training or just because you love it. F.M. Brown's Tropical Carnival Fruit and Nut Parrot Treat is loaded with natural chunky-chewy-crunchy fruits, nuts and veggies that your bird will love. Your pet will find our treats enticing, irresistible, nutritious and fun to eat! What a great way to reward your pet during training or just because you love them. This convenient zipper pouch makes it easy to reseal and maintain freshness. Size: 12 ounces. Brown's� EXTREME! Natural Baked Crisps are naturally colorful crisps that are oven baked, rich in antioxidants, and essential nutrients. This can be fed as a snack, reward, or training treat. These tasty treats come in fruit crisps that are made with real peaches, apples, pineapple, & banana and are rich in vitamins, berry crisps made with pure blueberries, raspberries, & strawberries, and garden veggie crisps that are made with sweet potato and carrots. This cockatiel bird treat is loaded with a variety of dried foods. Crunchy or chewy fruits, nuts, seeds, and veggies make their way into this balanced blend. Your bird will find it stimulating and fun to eat. Bits are sized ideally for cockatiels, lovebirds, and similar sized hookbills. Use for training rewards, mix in with regular diet, or try hiding a few bits in your bird's toys for a rewarding foraging experience. F.M. Brown's Tropical Carnival Crisp Sticks Tropical Carnival Crunchy Crisp Sticks are crispy, crunchy, colorful puffed interactive treats! These festive and fun to eat sticks are perfect for pet birds of all sizes. Size: 0.89 ounces. F.M. Brown's Tropical Carnival Natural Mixed Coated Peanuts for medium to large parrots, cockatoos and macaws make a great training reward or treat. They are rich in natural antioxidants and coated in all-natural berries and veggies: blueberry, cranberry and sweet potato. Size: 2.5 ounces. F.M. Brown's Tropical Carnival Natural Sweet Potato Yummies for pet birds are nutritious, wholesome, natural treats rich in antioxidants that are both easy to hold and fun to eat. Natural Yummies are tasty, training treats, snacks or rewards exotic birds will find simply irresistible. This food is formulated to meet the daily dietary needs of parakeets. A vitamin-enriched blend of ingredients provides complete nutrition with an irresistible gourmet flavor. F.M. Brown's Tropical Carnival Parakeet Food offers the nutrition birds need with a taste your pet will love. The premium ingredients meet daily dietary needs with an irresistible blend of gourmet flavor. Fortified with vitamins and nutrients, this food is also enriched with beneficial bacteria that aids in digestion to keep your bird active and happy. F.M. Brown's Tropical Carnival Gourmet Cockatiel, Lovebird and Conure Food is a natural, vitamin-nutrient-fortified daily diet. It's a food and treat, all-in-one! This super premium gourmet food is specifically formulated to help cockatiels, lovebirds and conures thrive. F.M. Brown's has jam-packed it with a mix of fruits, nuts, vegetables and wholesome seeds and grains such as pumpkin seeds, cashews, cantaloupe, corn and other delicacies. Tropical Carnival includes natural preservatives to ensure freshness. Omega Fatty Acids, antioxidants and beneficial bacteria help support good digestion. Size: 3 pounds. Brown�s� Tropical Carnival� Natural Small Hookbill Fortified Daily Diet is a vitamin-and-nutrient-fortified food and treat, all- in- one! It�s jam-packed with a medley of delicacies�including chili peppers�to satisfy your pet�s hunger cravings, and it�s specifically formulated for small hookbills� daily dietary needs. 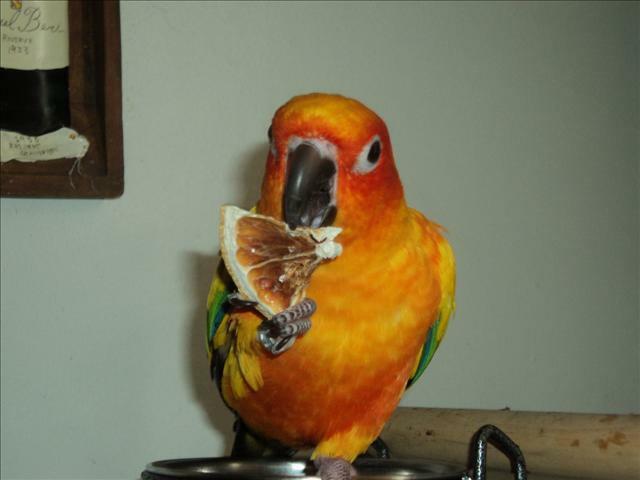 Brown�s® Tropical Carnival® Natural Parrot & Macaw Food is fortified with vitamins and minerals. It�s an all-in-one food and treat that provides an enticing and stimulating eating experience for your companion pet. Tropical Carnival® is jam-packed with a medley of delicacies to satisfy your pet�s hunger cravings, and it�s specifically formulated for large birds� daily dietary needs. We�ve blended the finest ingredients, with beneficial bacteria to support healthy digestion. The result? A hearty, great-tasting, healthy food your pet bird will find irresistible. It�s simply a natural fit!